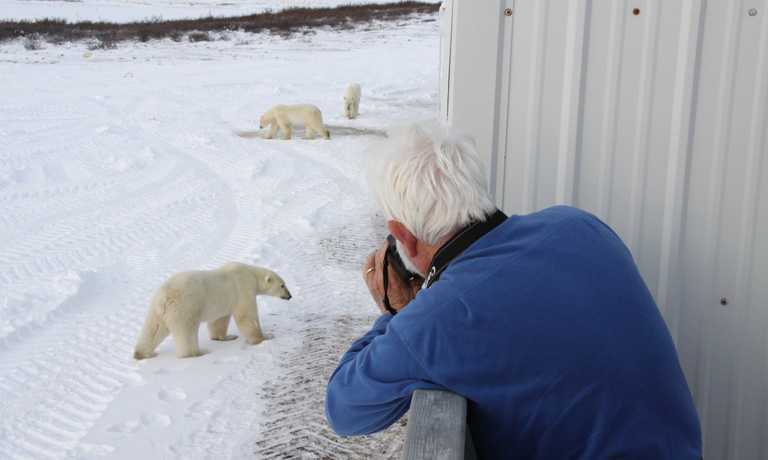 For the ultimate polar bear and High Arctic experience, look no further. 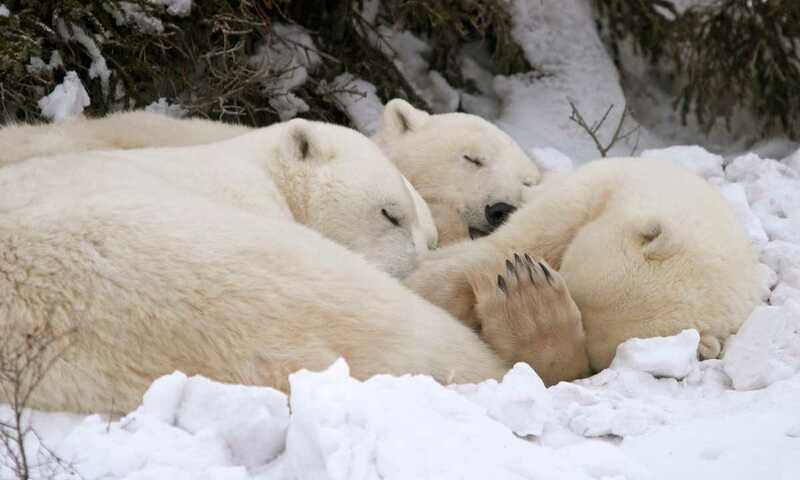 Two full days of polar bear spotting are combined with dog sledding, flightseeing by helicopter to a bear’s denning site and the chance to see the shimmering Northern Lights in one epic trip. A perennial favourite, early booking strongly recommended. 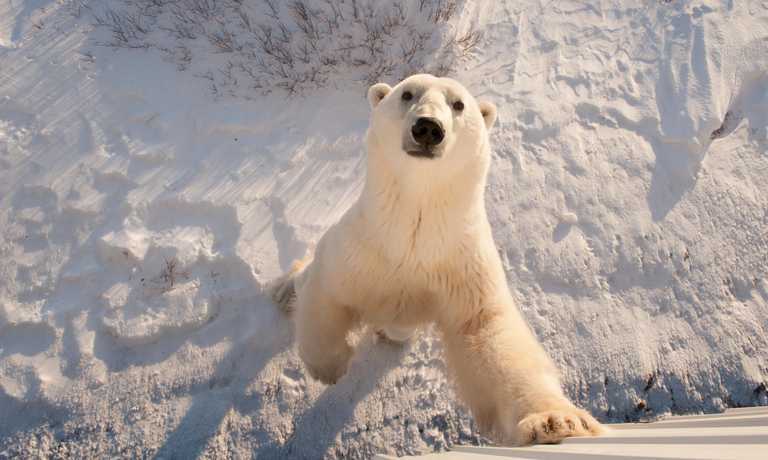 Your polar bear trip begins in Winnipeg, once a fur-trading post and boomtown for the Canadian Pacific Railway, today Manitoba's cultural and commercial capital at the eastern edge of Canada's vast prairies. Transfer to the historic Fort Garry Hotel, grande dame of Winnipeg hospitality and one of the city's most prestigious landmarks. Meet your Expedition Leader at an orientation dinner this evening. Fly to Churchill via the private chartered plane and explore this remote small community on a guided tour with the Expedition Leader. 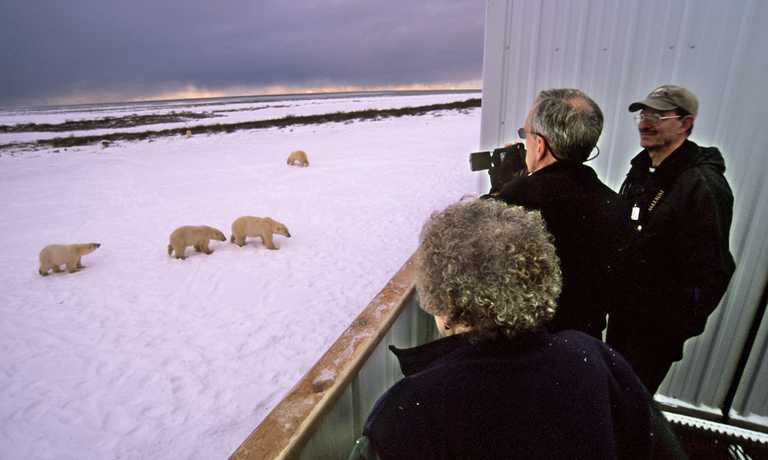 Originally a fur-trading post, Churchill is home to just under a thousand people and, in late fall, to hundreds of polar bears that congregate at the edge of Hudson Bay. You head to the tundra this evening for your first glimpse of the bears. Dinner is served aboard the enclosed Polar Rover in heated comfort. An exciting adventure is in store as you soar over the tundra in helicopters, surveying the frozen landscape below. From the air you may see polar bears, caribou and arctic fox. Landing on the tundra, disembark to explore on foot, perhaps even crawling inside an unoccupied polar bear den. You also sample an age-old means of Arctic transportation on a dog sledding excursion. Learn about the life of a musher, visit with the dogs, observe the team as they prepare for the run, then head out for an unforgettable ride behind an eager team of pure canine power! The immersion in Northern culture continues as Native hosts tell you about their traditions and what their daily lives are like. These captivating storytellers share tales from their personal histories and offer insight into the vibrant nations that have flourished amid adversity in this harsh environment for thousands of years. You'll also visit Churchill's Eskimo Museum, with artefacts collected from centuries of local habitation. The unique Polar Rovers are your mobile means for a full day on the tundra among the polar bears. Although these custom-designed vehicles accommodate up to 35 passengers, there will be a maximum of 16, ensuring everyone a window seat. The Expedition Leaders know the best places to see bears, which are waiting for the ice to solidify on Hudson Bay in order to begin the winter seal-hunting season. As you watch the bears interact, you'll delighted by their antics and rugged beauty. You'll have dinner back in town, and enjoy a presentation on wildlife or cultural aspects of life in the North. Once again you board the exclusive Polar Rovers for a full-day excursion to explore the subarctic scenery and watch wildlife. The pace is leisurely as you move over the tundra, pausing whenever you see bears to observe their behavior and capture photos. Tonight, if skies are clear, you'll visit a heated aurora dome in hopes of witnessing the northern lights. The phenomenon often begins slowly as a faint white glow, then intensifies in scope and colour as the lights undulate across the sky, shimmering curtains of electric green, waves of blue or even red. The Hudson Bay Inuit see the lights as the magical display of their ancestors' souls dancing in the sky. Though we now know the Aurora Borealis is caused by the interaction of the solar wind with the earth's magnetic field, they are no less entrancing. After time to pick up some last-minute Native crafts and souvenirs in town, enjoy a farewell lunch in Churchill. You then fly back to Winnipeg, where you have a final dinner before the adventure concludes.